that you can change and explore. When the pain of holding on is worse than the pain of letting go, it is time to leave, to release, to let go. Focusing on things that we cannot change only brings a sense of hopelessness and powerlessness. Whereas focusing on things that we can change can bring a sense of hopefulness, empowerment and liberation. There is freedom in knowing that by letting go, we can release our emotional connection to things or people that we feel dependent on. By letting go, we can make way for ourselves to truly pursue what we want to do with our lives. By letting go, we can change our perception and look at new possibilities in a different light. A more hopeful light. A more open light. As we put our focus more on something that we can actually control, we can stop dwelling on something that we can't. Give ourselves the gift of personal freedom to express our feelings through creative outlets, such as blogging, painting, cooking, or more physical outlets such as dancing, swimming, going to the gym, or anything that can replenish our spirit. This is not to forget or deny our pain, but to identify what the experience has taught us about developing a sense of closure and openness to personal growth and soulful transformation. 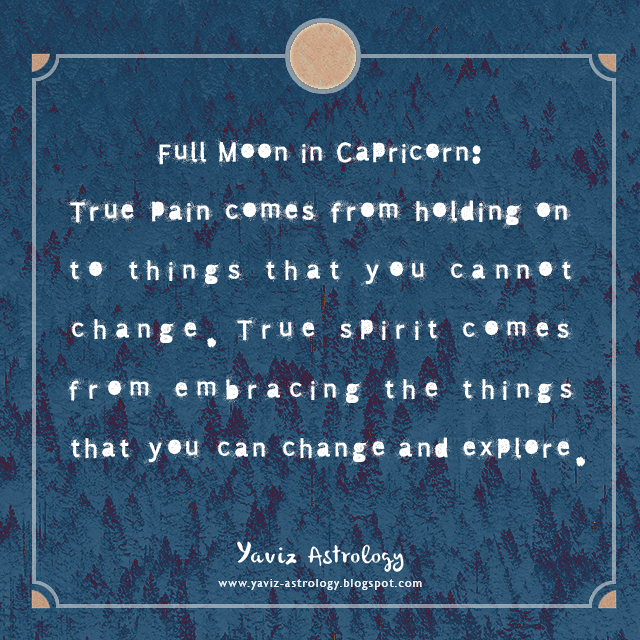 Happy Full Moon! The Moon is joining Pluto Rx in Capricorn and forming an opposition to the Sun in Cancer, marking a powerful Full Moon in the sign of the Sea-Goat. Rather than burying our emotions - which Capricornian energy tends to do, we are asked to uncover them to reveal deep truths about ourselves. Know that emotions do not need to be sensational to be transformative. Sometimes emotions can be something evoking that we experience deep within. Inspiring a personal change that transforms us to leave old shells behind, and moving us to embark on a path more in alignment with our truest and most authentic self. With the Sun in home-oriented sign of Cancer and the Moon in career-oriented Capricorn, the key is to find meaningful balance between our home life and working life. Understand that finding balance is a very personal process that varies from one person to the next. Because each person lead a different life and has their own personal connection to the meaning of time. Sometimes balance is not about dividing our time equally 50:50, but more about the quality of time that we hold for each person, place and activity in our lives. By understanding the meaning between quality time vs. quantity time, we get to explore the true meaning of time and the value of work-life balance. The Moon is forming a trine to Jupiter, and to bring our dream to life we must think long-term and pay no attention to the fluctuations in the present. Remember that life is a journey where joy and disappointment coexist within opportunities. Hence there is no need to fear the occasional obstacle that may appear along the way. This is an important time for letting go of what's not important and being selective about where to expend our energy next. With the Moon's sextile to Neptune Rx and Mars, an inner knowing speaks directly from our soul. We don't need to have someone else validate our inner message. We can validate ourselves as we trust our gut more and feelings more. We have the ability to read between the lines and to find the hidden truths. We are given information that may make no sense to the logical mind but which is true from a soul level. The trick is to listen and then to act accordingly. The Moon is also forming a square to Uranus and an opposition to the Sun, and opposing forces may come together to help us understand the value of chaos before order. Although conflict may now appear externally, the answer lies internally, providing us with the opportunity to see from more than one side of a situation. Be reassured that there is truth emerging in this time of change. Everything that doesn't work is being taken from us so that the truest part of ourselves remain and grow. Even in the seeming chaos, there is a re-sorting of elements so we can find a way out of the woods and onto the path to our true prosperity.